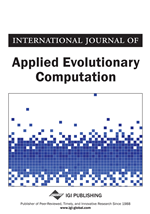 This paper demonstrates a novel local search approach based on an adaptive (time variant) search space index improving the exploration ability as well as diversity in multi-objective Particle Swarm Optimization. The novel strategy searches for the neighbourhood particles in a range which gradually increases with iterations. Particles get updated according to the rules of basic PSO and the non-dominated particles are subjected to Evolutionary update archiving. To improve the diversity, the archive is truncated based on crowding distance parameter. The leader is chosen among the candidates in the archive based on another local search. From the simulation results, it is clear that the implementation of the new scheme results in better convergence and diversity as compared to NSGA-II, CMPSO, and SMPSO reported in literature. Finally, the proposed algorithm is used to solve machine design based engineering problems from literature and compared with existing algorithms. Optimization is a methodology of making something perfect or more effective. Multi-objective optimization generally deals with the conflicting nature of the objectives to be achieved. Thus, researchers are finding new ways to tackle these conflicts and to obtain improved trade-off solutions in fewer iterations. The main aim of multi-objective optimization algorithms is to improve the Pareto- optimal solution convergence to the true Pareto front and simultaneously maintain good diversity (Sierra & Coello, 2006). Convergence is the closeness of the obtained Pareto-optimal front to the True Pareto Front and diversity signifies the uniform distribution of solutions over the True Pareto Front (Baviskar & Krishnapillai, 2016).